This book breaks new ground in the history of anthropology, opening up an explicit examination of anthropology in the Cold War era. With historical distance, Cold War anthropology has begun to emerge as a distinct field within the discipline. 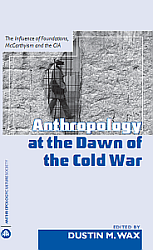 This book brings a number of different approaches to bear on the questions raised by anthropology’s Cold War history. The contributors show how anthropologists became both tools and victims of the Cold War state during the rise of the United States in the post-War period. Examining the intersection between science and power, this book is a compelling read for anthropologists, historians, sociologists, and anyone interested in the way in which colonial and neo-colonial knowledge is produced and constructed. Critique of Anthropology, June 2010, Vol 30, No. 2: Review by Heonik Kwon. Wax and other contributors to the volume should be congratulated not only for telling their colleagues about anthropology’s hidden past during the early Cold War, but also for opening a new way to investigate the shape of the Cold War political-intellectual complex. Journal of the Anthropological Society of Oxford, Vol. 1, Issue 1: Review by Iain Perdue [PDF; review starts pg. 111], 2009. In the last chapter the historiography of anthropology is considered, [effectively tying] the issues discussed in the book back to the present moment, thus preventing the collection from being statically located in the Cold War era and reminding the reader that these issues are once again present and contentious for the discipline. Though slim, this densely packed book attempts to add to the historiography of anthropology and provide context in place of paucity. Anthropology Review Database: Review by Robert Lawless, February 2009. Required reading for those interested in the history of the discipline, this book joins other important works, such as Price’s Threatening Anthropology, on the deleterious effects of the Cold War on anthropology. Socialist Review: Review of Anthropology at the Dawn of the Cold War, Penny Howard, April 2008. …a useful reminder of the political significance of [anthropological] questions and the extent to which governments have been prepared to go to ensure that they get the “right” answers…….a fascinating study in the political nature of ideas, and the terrible consequences of mechanical and deterministic approaches to Marxism. Perhaps the answer is somewhere in Wax’s forthcoming book, “Anthropology at the Dawn of the Cold War” (Pluto, May 2008), a collection, edited by Wax, of historical essays on “the relationship between the various factors characterizing the Cold War period and the development of anthropology at the time.” Sounds good to me! Three-part series documenting the process of putting Anthropology at the Dawn of the Cold War together, from inception to publication.